Did you know that over 240 million thank you notes are written each year? Wedding Thank You Notes, Modern Works of Art, is your go-to resource when writing your wedding thank you notes. This is the most comprehensive book you’ll ever need! Did you know that over 240 million Wedding thank you notes are written each year? 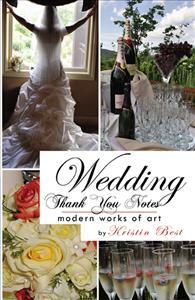 Wedding Thank You Notes, Modern Works of Art, is your go-to resource when writing your wedding thank you notes. This is the most comprehensive book you’ll ever need! Did you have a honeymoon registry, eco-wedding, use social media or give out welcome bags? If so, tons of note ideas are included for these modern wedding trends. This book is a lifesaver! We got married on March 17, 2012 and are now settling into married life. This past weekend I started writing our thank you notes. I have to write 125+ notes and this book has seriously done all the work for me. It has notes already written for the cash gifts we received, as well as for gift cards and other gifts we received like vases, frames and a sushi set. A friend of mine is getting married and she is concerned about writing all the thank-you notes. I want to buy her a book that helps. I found this recently published book in Barnes & Noble bookstore (and later here). After reading some pages. I feel the thank-you notes in this book are very sincere and practical. It includes most of the people you may need to send a thank-you note. There are plenty of completed sample wedding thank-you notes. If you prefer to be more specific and personal, this book offers all the essential elements for you to compose either a simple or more complicated thank you notes of your own. This book is a must have for any bride-to-be ! I received this book last Saturday, as a gift for my Bridal Shower. I’m using right now it to write “thank you notes” for my shower gifts. I definitely plan on using it for wedding thank you’s in a few months. It has notes for everything I received for my shower – like gift cards, towels, and a Kitchen-Aid mixer. After I’m married, I will use it to write all my thank you notes to our guests and special notes to my photographer, officiate, and make-up artist. Thank you notes have never come easy for me and I have been dreading the task even though the "Big Day" isn't for another 3 weeks! This book has totally changed my perspective and helped me appreciate each person involved in preparing for the wedding as well as the guests. I'm actually looking forward to writing them now! This is a wonderful resource book for wedding "Thank You" notes (perfect for those of us who want to express our sincere gratitude, but suffer from "brain freeze" after the third note! ).It offers many other clever and indispensable suggestions and tips for the modern bride and groom. I now often refer to it for other situations as well, and keep it handy next to my desk. Wish I had this years ago! What a delightful and useful book. There is enough stress in planning a wedding and no one wants to think about writing all those thank you notes afterwards but author, Kristin Best, has done it for us; from photographer to officiate to specific gifts to the wedding party, every possibility is covered. The notes are filled with sincerity and personal caring. A must for every engaged couple. My FMIL(future mother-in-law) bought this book for me at a Bridal Show and gave it to me at my shower. We passed it around and all my friends were saying they wished they had something like it when they got married (I’m the last one of my friends to tie the knot!) It helped tremendously with Shower thank you’s. I’m definitely planning on using it for my wedding thank you notes. I hope my soon-to-be husband will write notes for his side of the guest list – if he gives me any problems, I’m going to try the advice on page 20! LOL!! This book is the perfect mix of gratitude and inspiration. The people receiving your thank you notes will be charmed. I received text messages, emails and, calls saying our “thank you’s” were well received and how impressed our friends and family were by what we wrote. This book will not disappoint. I recently married, and got this with one of my shower gifts. What a gem of a book. Everything you could possibly think of to write a thank you note for, you'll find here. I had 105 thank you notes to write. Extremely helpful.